I just pulled this off my 2016 JKU Sahara. I bought a Rancho Sport lift and I pulled out this kit that I had on for about a year and less than 10K miles. It's the puck lift that comes with the 'extended' sway bar links to accomodate the lift. I didn't use the included links since I'm using the JKS quick disconnects so they're pretty much new. $80 picked up in San Diego. $10 extra to ship in the lower 48. 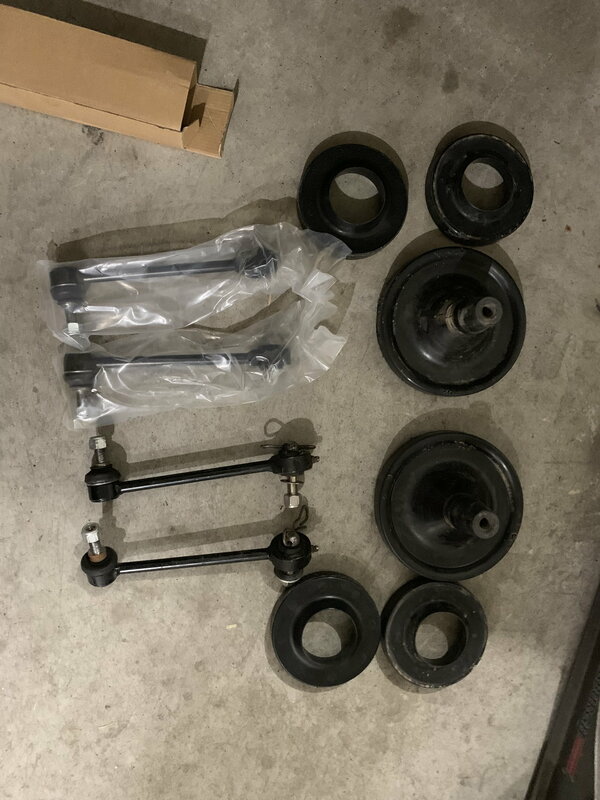 I'm also throwing in a set of Teraflex quick disconnects that I used but could never bolt down correctly. I'm not sure if mine were defective or if I'm just a complete idiot, wouldn't surprise me with the latter. Free with purchase of the leveling kit. I also have the factory springs and shocks if anyone needs them, FREE. do you still have the leveling kit? I'd it missing any parts? I'd like to buy it.